The First Genoese-Venetian War grew out of the two cities’ commercial rivalry along the eastern shores of the Mediterranean. Of the three major entrepots for highly profitable oriental wares,Romania (the Latin Empire), Alexandria, and Oltremare – as the Italians called the lands occupied by the Crusaders – only the latter seemed to be contestable in the middle of the thirteenth century. Romania appeared to have been firmly in Venetian control since 1204. Alexandria, after the collapse of Louis IX’s first crusade, was even more firmly in Egyptian hands. If the Genoese were to gain domi–nance in one of the major areas of Eastern commerce, only in the lands of the Crusader States did that dominance seem attainable. Friction in Acre, the chief port of Oltre–mare, was almost inevitable. The port of Acre was divided into distinct quarters, each virtually self-contained with its own piazzas, palaces, and even government. The Genoese, the Venetians, and the Pisans as well as the Hospitallers and the Templars formed separate entities within the city. When a Venetian merchant murdered a Genoese, perhaps as early as 1249, the tatter’s compatriots took up arms and stormed the Venetian quarter.3 In following years other incidents kept relations between the two communities in turmoil. Attempts by European powers, especially the pope, to mediate the disputes met with little success. As the dispute unfolded in Acre, Pisa, not surprisingly, sided with Venice as did the Knights Templar and merchants from Provence – in short, Genoa’s competitors in the western Mediterranean. Genoa, in turn, found allies among the barons of the Cru–sader States, especially Philip of Montfort, lord of Tyre.4 By the summer of 1257 tensions were at a crisis level, but there was not, as yet, open war. When the Venetian merchant caravan departed for Acre that year it was accompanied by a war fleet of fourteen galleys commanded by Lorenzo Tiepolo, the son of the former doge Giacomo Tiepolo and a warrior of considerable reputation.5 The incidents leading to the war were only symptoms of the underlying tensions. Murder, dispute over a monastery, and riots in Acre were the match that touched off the dry tinder of economic ambition and conflict. Prevailing winds, currents, and geography constrained shipping in the medieval Mediterranean to certain predictable paths.6 It is within this strategic framework that the belligerent commanders had to operate. Before the age of steam, wind was the dominant means of powering travel upon water. The principal warship of the Mediterranean, the galley, carried a large crew that could propel it with oars. Nonetheless, galleys traveled under sail approximately half the time they were at sea.7 Even when a galley was traveling under oars wind would have been a factor, because rowers would have found it difficult to row into the wind for any considerable length of time. The result was that both purely sailing ships and galleys almost invariably found the most efficient routes to their destinations along the same routes year after year. Galleys were further constrained by their limited carrying capacity which meant that space for provisions, especially drinking water, was very restricted. This limit, combined with the very crowded conditions on board made it desirable for them to put in to shore every night, further restricting their choice of routes. The early stages of the Genoese-Venetian war were fought in the harbors of Acre and Tyre. The Venetians demonstrated their tactical superiority and dominated the Genoese fleets, but were unable to expel them from Tyre, where they were supported by the lord of the city, Philip of Montfort. Two developments in the wider Mediterranean context changed the course of the war. First, the Genoese allied with Michael Paleologus who, in 1261, captured Constantinople and expelled the Venetians, sud–denly reversing the situation that had prevailed throughout the first half of the century. Second, in 1264, Charles of Anjou began his conquest of the Kingdom of Sicily that ended with the extermination of the Hohenstaufen and further destabilized the overall strategic picture. These two developments led to a widening of the war between Ven–ice and Genoa beyond Oltremare to all of the central and eastern Mediterranean. This first war fought between Venice and Genoa was characterized by over–whelming Venetian superiority in fleet actions, while the Genoese waged a punishing guerre de course against the merchant shipping of the Serenissima. This produced an odd situation in which the Venetians were on the strategic defensive, but operationally and tactically often pursued an aggressive offense. The Genoese, strategically on the offensive, often behaved as though they were uncertain about their larger naval aims and almost invariably adopted a defensive tactical posture in fleet actions. Still, at times in their war against Venetian commerce the Genoese seized the initiative, and they were occasionally brilliant on the operational level. Two examples should suffice to give the flavor of operations in the later Mediterranean-wide phases of the war. In 1264 the Genoese carried out a large-scale and highly successful raid on Venetian commerce. This operation is instructive because it reflects both the strengths and weaknesses of the Genoese and Venetian capacity for war in the mid-thirteenth century. It also illustrates the part played by intelligence-gathering, rumor, and disinfor–mation in a campaign. In spring of that year, the Genoese assembled a fleet consisting of two very large navi (lateen-rigged sailing ships) and twenty galleys (bireme galleys) carrying a fleet total of 3,500 men.8 The naviwere said to have been so large that they had been built with communal funds rather than privately as was usual at Genoa.9 As the fleet was about to depart for Oltremare in June 1264, the admiral, Simone Grillo, encountered a typically Genoese problem. Grillo, a noble of the Ghibelline party, apparently reacted to his elevation to command with some arrogance and even appeared to court popular elements in the city. At Genoa the Ghibelline party was re–puted to be more “popular” than the Guelf party, which included among its ranks some of the greatest fief-holders of the Riviera. Grillo was accused by members of the Grimaldi family and their supporters of fomenting a rebellion with the aim of making himself Capitano del Popolo. Only two years earlier a noble revolt had brought an end to the government of the first Captain of the People, Guglielmo Boccanegra, who had risen to power in a popular uprising in 1257. The Grimaldi, Fieschi, and other Guelf nobles were obviously made nervous by the appointment of a potential leader of the popolo to this important and prestigious fleet command. They pressed the podesta to attack Simone’s house, but his men were repulsed with a barrage of stones. As the bells of the church of Santa Maria delle Vigne sounded the alarm, the podesta re–grouped his forces and was joined by the armed followers of almost all the nobility of the city.10 If, indeed, Simone had hoped for a popular insurrection to bring him to power in the city it did not materialize, or at least not on a large enough scale to over–come the forces of the podesta and the Guelf nobles.11 He was forced to seek terms. Evading his enemies in the streets, he made his way to the podesta’s palace where, after three days of negotiation and pledges of security by his nephew and friends, the admiral was able to join the fleet that was already at Portovenere.12 Factionalism and internal conflict would plague Genoese operations throughout the wars with Venice, and would, by the end of the fourteenth century, cause the city’s collapse as an inde–pendent political force. Exaggerated reports of Genoese preparations reached Venice, sent either by Grillo’s enemies in Genoa, or – according to some reports – by boastful Genoese who claimed that they were sending out a huge fleet of six ships and ninety galleys. The Serenissima prepared to meet the challenge with a powerful fleet of some fifty galleys under the command of Andrea Barocio.15 Barocio was to block or destroy the Geno–ese, clearing the way for the Levant caravan. The Venetians, confident of their ability to defeat the Genoese at sea, usually tried to minimize expenditures by sending out war fleets of approximately the same numbers as, or fewer than, the Genoese. This confidence was well founded, since the Venetians had had the better of every fleet action since the war’s beginning. In the end Barocio’s superior numbers were irrelevant, as he was cleverly misled and outmaneuvered by Grillo. In light of what fol–lowed, it is conceivable that the rumors of a very large Genoese fleet were deliberately spread by Grillo’s agents as part of a campaign of disinformation to draw the Venetian fleet out in a predictable fashion. Grillo, finally free from the political turmoil that had followed his appointment as ad–miral, proceeded swiftly south along the route to Oltremare, reaching Malta “in a few days.”16 This fast voyage to Malta appears to have been an important part of Grillo’s plan since – as shall be seen – it put his fleet well south of where his Venetian opponent expected to find him. As he stopped at ports in southern Italy and Sicily he continued to call attention to his plans to sail to Acre.17 Indeed, he had firm orders, and had given security to the Genoese podesta, that he would proceed there without devia–tion. After arriving in Malta, Simone remained there for some time. Barocio, hearing and believing the reports of Grillo’s intentions, took his war fleet toward Sicily to in–tercept the Genoese. The waters around and south of the Straits of Messina constitute one of the strategic narrows of the Mediterranean where maritime traffic is forced into predictable paths. If Simone Grillo’s actions had matched his proclaimed intentions Barocio would almost certainly have found and destroyed the Genoese fleet without danger to any of the ships of the caravan. Only the year before, near Settepozzi in the Morea, thirty-two Venetian galleys had resoundingly defeated thirty-eight Genoese galleys. Barocio’s fleet outnumbered Grillo by more than two to one; any battle should have been another crushing victory for the Venetians. Meanwhile, Barocio arrived in Sicilian waters where he cruised in a vain search for Grillo’s force. 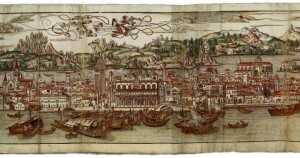 Upon hearing that the Genoese fleet had departed for Acre with an intention to ravage Venetian possessions in Oltremare, Barocio hurried east to protect his city’s interests. The Genoese admiral acted throughout the campaign as though he had excellent intelligence regarding the movements of the Venetian fleet. 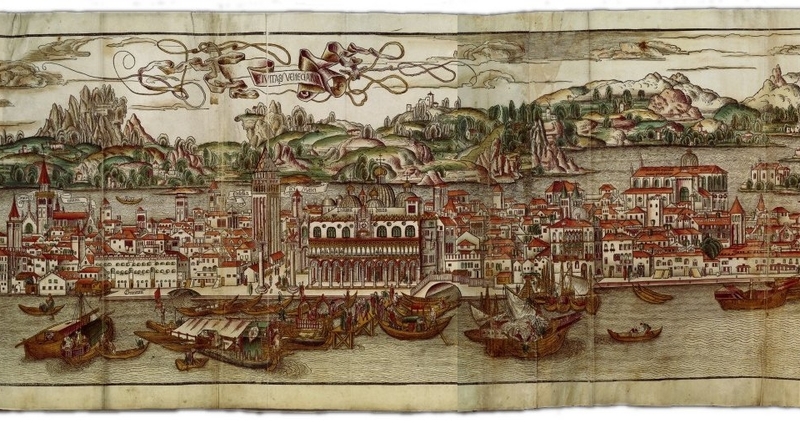 According to the contemporary Venetian chronicler, Martino da Canal, the government of Genoa had bribed one Nicola, a notary of the Great Council from Treviso, to keep them informed of all orders issued to the Venetian fleet.19 Even if there were no treacherous mole inside the Venetian Great Council, Simone might just as easily, and perhaps more plausibly, have had agents and contacts along the Sicilian coast to inform him of the arrival and actions of the Venetian fleet. However the intelligence was acquired, Grillo seems to have been exceptionally well-informed of Barocio’s actions. When the Genoese commander was sure that the Venetians had taken the bait, he began to move. After remaining for a while in Malta, Grillo sailed eastward. About a hundred miles east of the island he encountered a ship carrying merchants from Messina returning from Oltremare.20 According to the anonymous Genoese civic chronicler, he learned from the Messinese that conditions in the Levant were such that there was nothing he could hope to accomplish that would be “useful and that would redound to the honor of the city of Genoa.”21 At least some Venetian accounts of the campaign mention that he sent a small trading vessel north into Sicilian waters to be captured by the Venetians to misinform them that Grillo had already departed for Oltremare.22 There are too many layers of possible deception present in the sources to disentangle them at this distance in time. Grillo had reason to invent the capture of the vessel from Messina because it gave him a plausible reason to deviate from the course to Oltremare that he was bound by his promises and pledges of security to carry out. The Venetians had reason to invent an incident of Genoese perfidy to explain how they were outmaneuvered by Grillo. It is just possible that Grillo did capture a small merchant ship from Messina and let it go with (mis)information that he was on his way to the East and that Baroccio later captured the same vessel and received from it convincing – even if incorrect – intelligence about Grillo’s intentions. It is also possible that Grillo did send a vessel with deliberate disinformation into the path of the Venetians. The sources are unclear on the exact timing and even the sequence of events, in an operation in which timing was very important. Obviously, the best situation for Grillo would have been to leave Malta after Barocio had passed to the east of the Ge–noese course for the Straits of Otranto, so that the Genoese fleet would pass behind him. Failing that, it would be desirable that the Venetian fleet remain in the vicinity of Sicily. The least favorable circumstances from the Genoese admiral’s point of view would be for Barocio to depart for the East at about the same time as Grillo sailed northeast, creating a situation in which the two fleets might meet. Well to the east of Malta Grillo detached the two big navi and three galleys, sending them to Tunisia to trade. This action makes sense only if he used marines from the detached galleys to reinforce the remaining galleys. A little later he detached another galley which he sent east. The Genoese chronicler says it was sent to the Byzantine emperor, but it seems more likely that it was sent as a scout to keep watch on Barocio’s movements. If the latter was the case, then it suggests that Grillo knew that Barocio had sailed for Oltremare. The Genoese strike force, now sixteen galleys, sailed northeast toward the mouth of the Adriatic where, because of the narrow shipping lanes, Grillo was virtually certain to find the Venetian merchant fleet. When our men saw the caravan, they were overcome with great joy, and moved against them vigorously and swiftly. The men of the caravan, seeing our galleys, gathered all their fleet together. And there were three navi – one of them much larger than the others – thirteen big taride with fighting tops, a panzone, two galleys, and a saetta. And they made a kind of castle or carrocio 23 of the great nave, ridiculing our men, throwing chickens into the sea shouting, “Fight with these!” Then, our men began a sharp fight. And the battle began about vespers and, finally, around midnight, they weakened the navi and raride so that the Venetians, fleeing, crowded together in the great nave after having abandoned all the other ships and vessels. Our men captured the taride, the navi,and the galleys, and of them, one nave was sunk and a tarida was burned. The “great nave” was the famous Roccafortis, one of the largest ships of the thirteenth century. The defensibility of these huge vessels, with large crews and sides that towered above the low galleys, is amply demonstrated by this fight. It has been said by a recent maritime historian that Mahanian control of the sea was not possible for galley fleets since they could not remain at sea for long enough periods to maintain a real blockade.25 But the effect of this battle was virtually the equivalent of a successful blockade. Not only was the victory profitable for the Genoese – the same chronicle reports that it was “common knowledge that the Venetians suffered a loss of more than 100,000 lire di genovini and the commune of Genoa gained from the sale of the prizes more than 30,000 lire di genovini for its treasury” – but it cost the Venetians a whole year’s trade with Oltremare. Far from being at sea in superior numbers, the Venetian admiral Jacopo Dandolo had sailed west with only fourteen galleys.31 He proceeded to Tunis where, in a night attack, his men cut out a Genoese ship, captured its crew and, after they had off-loaded its cargo, burned it. The next morning a small Savonese craft with thirteen men and a cargo of wine arrived at the port where it, too, was taken. Dandolo then left Tunis to return to Messina. Along the way he encountered a Portovenerese corsair squadron of two galleys and a saetta. One of the galleys and the saetta escaped, but the other gal–ley was taken with most of its crew.32 The Venetians were obviously cruising in the Sicily channel searching for Genoese and allied shipping, perhaps seeking the battle fleet that was still moored in Bonifacio. After disposing of their booty in Messina, Dandolo and his men, seemingly pleased with the results of their cruise, began their return journey. As these events were unfolding, news of the growing Genoese fleet reached Ven–ice. The doge sent out a second squadron of ten galleys under the command of Marco Gradenigo to reinforce Dandolo.33 The two fleets met at Ragusa and the commanders decided to proceed to Sicily in search of the Genoese fleet. Many Venetian nobles on board the ships were becoming anxious because the time was drawing near for their own summer caravan to depart for Acre and they feared that they might miss the opportunity for trade that year.34 When word arrived that the Genoese fleet was still in Bonifacio harbor, a number of them decided that the time required to wait them out would be too long and they were put ashore to make their way overland back to Venice.35 This may account for the report in the Genoese chronicle that the fleets rendez–voused at Gallipoli on the Bay of Taranto.36 The combined Venetian fleet, now consisting of twenty-four galleys and a saetta or two, sailed west to intercept Borbonino. Lanfranco called together his three councillors and the commanders of the galleys for a council of war. It is evident that they did not trust the men under their command, many, if not most, of whom were “Lombardi et forenses” hired as substitutes for Genoese citizens who thus evaded their obligation for fleet service.39 The advice of the council was that the fleet should stand out to sea to attack the Venetians from seaward, so that the unreliable hired rowers would not be tempted to abandon their posts to swim for shore. During the night, however, other advice prevailed. Borbonino decided, in the words of the Genoese chronicler, “stupidly and lost in cowardice, to change his plans and to adhere to worthless advisors.” He adopted the classic defensive position of galley warfare, chaining his galleys together, sterns to shore, and prows outward.40 There were real advantages in this position, especially in the face of a more skillful, aggressive opponent. The fleet could not be surrounded; the vulnerable sterns of the galleys were protected from attack. Nor could its formation easily be broken so that individual galleys could be overwhelmed. Reinforcements could easily be shifted from one vessel to another in the line, and the rowers were freed to join the fighting force from the beginning of the battle. Of course, success in this formation presupposes that the crews will stand and fight. The enemy arrived and seeing the galleys bound and chained and, hoping that the Genoese were terrified and panicked, they began to advance boldly against the Genoese, shouting loudly in the way that one advances on people who are lost and foolish. The Genoese, seeing the enemy advancing against them, and seeing that their leader had lost vigor, advice, and good sense, immediately abandoned their galleys and threw themselves into the sea. The galleys were all taken without any battle and without defense. And thus the enemy because of negligence, because of wretchedly bad advice, and because of the cowardice of the admiral, captured all twenty-seven galleys, of which twenty-four were towed away and three were burned. And with this victory they made their return, after having captured and detained some of the men who had not fled. On returning to Genoa Lanfranco Borbonino, his councillors, and all the galley com–manders except for five were convicted of incompetence and cowardice and sentenced to pay huge fines and to confiscation of all their goods. These two campaigns are virtually perfect examples of how skillful commanders could make use of the narrow shipping lanes to plan and execute campaigns. In the Durazzo campaign, both commanders showed a thorough understanding of the importance of the strategic narrows in naval warfare. Grillo moved swiftly to get south of the area around the Straits of Messing where he knew the Venetians would try to trap him. Barocio moved directly to that same area to cruise where, in most cases, he would have had a good chance of finding the Genoese fleet. Both fleets relied on intelligence from various sources to locate their enemy. Grillo, when he was sure that the superior Venetian fleet was out of position, sailed for the Straits of Otranto to wait for the Venetian merchant caravan. While the Venetian, Barocio, was competent but unsuccessful in the most important part of his mission, Grillo was either brilliant or incredibly lucky. In the Trapani campaign, Dandolo cruised the Sicily Channel where, if Borbonino had been at all aggressive, Dandolo would have had a good chance of bringing the Genoese to battle, and where, in any case, he had considerable success preying on Genoese merchant shipping. Then, with better intelligence of his enemy’s whereabouts and with reinforcements, Dandolo returned to Sicilian waters where he brought Borbonino to battle. Unfortunately for the Genoese, Borbonino lacked the dash and initiative shown by Grillo two years earlier. He moved slowly and predictably, and when the time for battle arrived he chose the most cautious of tactics. His caution and uncertainty cost him the confidence of his men and, in the end, cost him the battle. Such, at least, was the judgment of his contemporaries. Certainly these campaigns demonstrate that thirteenth-century admirals were capable of conceiving and carrying out complex, and even brilliant, operational plans comparable to those of commanders of any age. 2. For an analysis of the strategic situation see John E. Dotson, “Naval Strategy in the First Genoese-Venetian War, 1257-1270,” American Neptune 46.2 (1986) 84-90. 3. Ceccardo Roccatagliata Ceccardi and Giovanni Monleone, trans., Annali Genovesi di Caffaro a dei suoi continuntori 6 (Genoa 1929) 56 and n. 3. See also Georg Caro, Genova a la supremnzia sul Mediterrnneo, 1257-131 / vol. 1, Atti delta Societa ligure di Storia Patria n.s. 14 (Genoa 1974) 37-38; Frederic C. Lane, Venice: A Maritime Republic (Baltimore 1973) 75. 5. Annali Genovesi (n. 3 above) 6.58; Lane (n. 3 above) 75; Caro (n. 3 above) 1.40; F. C. Hodgson, Venice in the Thirteenth and Fourteenth Centuries (London 1910) 122. 6. Dotson (n. 2 above) 84-90. John Pryor, independently, and much more fully, demonstrated this in his Geography, Technology, and War: Studies in the Maritime History of the Mediterranean, 649-1571 (Cambridge 1988). 7. This information was rarely recorded, but for at least one voyage in the sixteenth century there is a de–tailed record; see Elena Fasano-Guarini, “Au XVIe siecle: Comment naviguent les galeres,” inAnnales: ESC 16 (1961) 285. With favorable winds galleys could sail at speeds that nearly equaled their fastest speed under oars and could sustain the pace as long as the wind continued. However, because of the limitations of their designs, only a wind blowing nearly directly in the direction of their intended course was favorable enough to allow this; John Coates in his “The Naval Architecture of European Oared Ships,” a paper given at the spring 1993 meeting of The Royal Institution of Naval Architects. 8. This sketch of a bireme galley and a large navis illustrates the relative sizes of the vessels and the tactical difficulty that such a large ship presented to a galley. The navis is based on measurements given for the Roccajortis in a contract chartering the vessel to Louis IX for his crusade of 1268. It is generally accepted that this is the same vessel involved in the battle with the Genoese in 1264. The contract gives only stevedore’s measurements and says nothing about the rigging. The drawing here is a schematic reconstruction based on these measurements, other sources, iconographic evidence, and imagination. The prominent rudder is based on the reconstruction by Lawrence V. Mott, The Development of the Rudder: A Technological Tale (College Station, Tex. 1997) 83. The bireme galley is based upon measurements of a galley of Charles I of Anjou, king of Naples, dated 1275 as given in John H. Pryor, Geography, Technology, and War: Studies in the Maritime History of the Mediterranean 649-1571 (Cambridge 1988) 64-66. The measurements were fleshed out with iconographic evidence and, again, imagination. The galley is shown with its yards stowed for battle, its crew rowing in pursuit while the round ship is fleeing under sail. 9. Annali Genovesi (n. 3 above) 6.97. The Paradisus Magnus, the flag ship of St. Louis’s crusade of 1248, sailed to Tunis in 1251 on a trading expedition with a crew of 100 men; Eugene Byme, Genoese Shipping (Cambridge, Mass. 1930) 110-111. This was one of the largest ships of the mid-thirteenth century. If these two ships were similarly large and we assume that they carried 150 fighting men in addition to the sailing crew, that would leave 3,000 men to be distributed among the twenty galleys for 150 men on each. These were certainly bireme galleys, so if 108 were rowers, then each carried 42 officers, staff, and marines. Cesare Ciano, “Le navi della Meloria, caratteristiche costruttive a di impiego,” in Genova, Pisa a it Mediterraneo tra due a trecento, Atti della Society Ligure di Storia pahia n.s. 24.2 (Genoa 1984) 410 also suggests an average of 150 men per galley distributed among 100 rowers and 50 marines. Mid fourteenth-century Geno–ese law required a fully armed trireme merchant galley to have, in addition to rowers, a captain (comitus), scribe, and sailing-master (nauclerius), and 12 crossbowmen, for a total of 176 men. These trireme galleys would have had twenty-seven benches on a side, with 3 men to a bench for a total of 162 rowers. 12 cross–bowmen, the scribe, and the nauclerius bring the total to 176, with the comitus standing outside the total of the crew; John E. Dotson, “Safety Regulations for Galleys in Mid-Fourteenth-Century Genoa: Some Thoughts on Medieval Risk Management,” Journal of Medieval History 20 (1994) 330-331. In the bireme galleys of the thirteenth century the officers’ list could not have changed much; there would have been two–thirds as many rowers (assuming the same twenty-seven benches, with 2 men to a bench for 108 rowers). It seems reasonable to assume that a war galley engaged in offensive operations would have carried a larger number of fighting men. Marine swordsmen and pikemen would have been necessary for the boarding actions that were so much a part of galley warfare. The number of crossbowmen might also have been augmented. 12 crossbowmen and 28 swordsmen and pikemen, or some similar distribution, does not seem unreasonable for the task at hand. 10. Annali Genovesi (n. 3 above) 6.97. 12. Annali Genovesi (n. 3 above) 97-98. 13. Lane (n. 3 above) 70. The term muda, which can mean either the caravan or the period in which it was to sail, is often applied to these convoys. 14. Camillo Manfroni, Storia delta marina italiana 2 (Livorno 1902) 13-14. 15. Andrea Dandolo, the mid fourteenth-century doge and chronicler put the number of the Venetian fleet at fifty galleys and agreed that Grillo’s fleet was made up of twenty galleys; Ester Pastorello, ed.,Andrea Dandolo, Chronica per extensum descripta in Rerum Italicarum Scriptores, ed. 2, 12.1 (Bologna 1938–1940) 312. The anonymous author of this volume of the Annali Genovesi (n. 3 above) 101-102 says that the Venetian fleet consisted of fifty-two vessels including galleys, taride, and navi and puts the number of galleys at forty-four. Georg Caro relied on the contemporary Venetian chronicler, Martino da Canal, for a figure of forty-seven galleys. 16. Annali Genovesi (n 3 above) 98. 17. Lane (n. 3 above) 77. 18. Sources vary regarding the exact number of vessels in the caravan; Caro (n. 3 above) 1.162 n.19. 20. Annali Genovesi (n. 3 above) 98. The Genoese maritime mile was the equivalent of 1.734 km. The statute mile in use in the U.S., and until recently in Great Britain, is equal to 1.6093 km and the international nautical mile is 1.852 km. The phrase “about one hundred miles” would be acceptable for any of these mile measures. 21. Ibid. 99. This phrase would also serve to mitigate the fact that Grillo’s actions, however successful, were technically in violation of the commitments he had made before departing from Genoa. 22. Manfroni (n. 14 above) 2.13. 23. A carrocio was a large wagon pulled by oxen, typically carrying various banners and civic and relig–ious symbols that marked the rallying point of medieval Italian municipal armies. It was guarded by the best troops of the city. Oxen are slow, so it could not easily flee the field, but such was its importance that the loss of the caroccio signified the complete defeat of a city’s army. 24. Annali Genovesi (n. 3 above) 99-100. See also Lane (n. 3 above) 77; Caro (n. 3 above) 1.163-164. The incident of the chickens suggests that some time was spent in posturing and threats before the battle was joined. Also, in recounting the number of Venetian vessels captured, the chronicler seems to have forgotten that he reported that one of the taride was burned. 25. John F. Guilmartin, Gunpowder and Galleys: Changing Technology and Mediterranean Warfare at Sea in the Sixteenth Century (Cambridge 1974) 16ff In all fairness, Guilmartin was writing about a later period when the strategic problems were somewhat different from those in the thirteenth century. 26. Annali Genovesi (n. 3 above) 101. Caro (n. 3 above) 1.165 says that the cargo was cotton. 27. Annali Genovesi 101-102; Caro 1.165. 28. Annali Genovesi 102; Caro 1.166. 29. Annali Genovesi 153; Caro 1.180-181. 30. Citing a series of notarial documents relating to crew members of vessels in the fleet, especially sev–eral dated as late as April 30, Caro suggests that Borbonino’s fleet did not depart until early May. He re–solves the apparent discrepancy between these documents and the chronicle by suggesting that the fleet had departed the port of Genoa in late April, but remained just outside the port for a few days. The jumping off point for Genoese vessels departing the city’s territory was Portovenere. This was where Simone Grillo joined his fleet in 1264. In 1351 the galley of Simone Leccavello departed Genoese territory from Portovenere, and that was the point where a number of the crew deserted or repaid the advances they had received on their pay and left the galley; John E. Dotson, “The Voyage of Simone Leccavello: A Genoese Naval Expedition of 1351,” in Saggi a Documents 6, Civico Istituto Colombiano, Studi e testi 8, ed. Geo Pistarino (Genoa 1985) 274. It seems likely then that the fleet might well have left the port of Genoa in late April, but did not leave Genoese territory from Portovenere until early May. This would have allowed Borbonino to know of the preparation for reinforcements and helps to explain his decision to wait for them in Bonifacio. 31. Caro (n. 3 above) 1.181 n. 10, citing Canal, says that the Venetian fleet consisted of three galleys and a galiota from Negroponte, four from Crete, three from Zara, and four from Venice. The Annali Genovesi (n. 3 above) 6.153 gives the strength of the Venetian fleet as ten galleys. 32. Annali Genovesi 154; Caro 1.181-182. 33. Hodgson (n. 5 above) 133. 34. The summer caravan, which – as noted above – was required to depart Venice by August 15 began forming earlier in the summer. All the crew of the ships were required to be hired before the end of July; Lane (n. 3 above) 69. 35. Caro (n. 3 above) 1.182 n. 17. 36. Annali Genovesi (n. 3 above) 155. 39. Ibid. 155-156; Caro (n. 3 above) 1.183 n. 21. 40. Annali Genovesi (n. 3 above) 156. This article is from Viator: Medieval and Renaissance Studies v. 30 (1999). We thank the Center for Medieval and Renaissance Studies of the University of California Los Angeles for giving us permission to republish this article. This entry was posted in Articles and tagged 13C, 14C, battles, Genoa, Italy, naval, social history, Venice. Bookmark the permalink.